The fancy buns of Huanghua are a type of sweet and soft buns native to the northern part of the county of Huanghua, more specifically, the town of Yang Erzhuang, where they are an old tradition. According to historical annals of the county, at the beginning of the 14th century, the soldiers of emperor Zhu Di from the Ming Dynasty killed a lot of the inhabitants of this area during a campaign to fight the Jingnan rebellion, leaving the territory deserted. A few years later, people migrated from the county of Hongdong and repopulated the area of the Bohai sea coast. The Huanghua Yang Erzhuang area is a saline-alkali dry land where a local type of wheat is grown. It has very low need for water. Thus, it is rarely irrigated. The Huanghua wheat has a low yield and traditionally the inhabitants of this region lived in poverty. In fact, on holidays and religious celebrations, they didn’t have much to make offerings to gods and ancestors. So, they started using the rare, local, but very nutritious wheat to make fancy shaped buns and used them as offerings to gods and ancestors to pray for harvest, happiness and luck for the coming year. In order to make the buns they would first mill the wheat and make the flour into a dough. 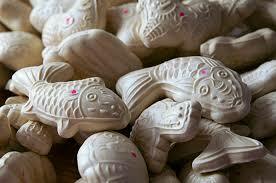 The dough was placed it into hand-carved, wooden molds and then the buns would be steamed. The buns could thus be made into various elaborate shapes inspired by nature such as fish, hedgehog, chicken, flowers or fruit, all things that should have been given as offerings. The carving of the wooden molds is a family tradition and nowadays it is still being passed on by a family in Gao Guan Zhuang village who started crafting them in the middle of the 19th century. Carving the wooden molds and then preparing the buns requires craft and is a real artisanal work that today few are ready to take on. In the Huanghua county a few families still make them for traditional celebrations and there is a factory that makes them as well. But since most of the steps require manual work, it remains an artisanal production.